StarGame is coming to iOS! So I’ve been taking online courses on iOS development with Swift (the Stanford lectures on iTunes U are amazing!). Since I have some experience in Java, learning Swift (Apple’s new programming language) wasn’t very hard. Some test projects included a maths homework helper app and a “Happiness” project from the Stanford lectures. Anyways, what could I gather from the projects is that my java game “StarGame” can definitely be ported to iOS! 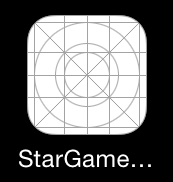 In fact, the image above shows the (currently blank) “StarGame Mobile” app icon in the iOS Simulator. However, don’t get too excited yet as closed beta testing might start this year and release is planned for 2016 at the earliest. In the meantime, make sure to check out the StarGame Beta, a 2D side-scrolling game originally made for the desktop. If you have any comments or ideas, feel free to comment below or hit me up on Facebook and Twitter.